BCM’s latest system, the BCM 8000 Multimedia takes music to an entirely new level! With the BCM 8000 Multimedia not only will you experience the latest music but you will also enjoy video clips, digital signage capabilities, a DJ module as well as online downloading from our digital music archive. Display your own pictures, videos, text scroller and real-time RSS & Twitter feeds on your TV displays! The BCM 8000 Multimedia adds something special to your venue. With unprecedented ease you control music, video clips, playlists and song requests. Perfectly tailored to your style and venue. Communicating with your customers has never been easier. Your TV displays show your own promotional material like pictures, videos and text. You can choose to display your own selection of real-time news feeds like world news, local news, weather, sports or Twitter. Every moment of the day you have complete control over the information on your TV displays all from one easy-to-use program scheduler. Via the Internet you get access to all available songs in our digital music archive. Our music servers are constantly updated with the latest music. Every day you can download new and exciting songs from our digital music archive. All the music you need in one easy system! Our multiroom system, which supplies up to 4 zones with their own music feed, is the answer! With the BCM multiroom system you have the music ambiance you need for every room. The multiroom systems are available with multiple touchscreen configurations and combine ease of use, durability, and continuity with impeccable sound quality. fford disruptions in your music? Bad sound quality? You’ll never have to worry about that with the BCM 8000 Multimedia System. The hardware craftsmanship and the robust software keep your system running even under extreme conditions. 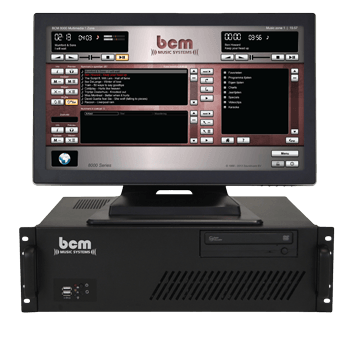 The BCM 8000 Multimedia System is a durable investment. Only high-quality components are used in combination with studio quality audio hardware. The housing provides a solid platform for the system. The industrial grade touchscreen is very reliable, even in a moist environment. Every system is hand build and extensively tested. BCM Music Systems is the partner that gives you the edge. We have been a reliable music partner for over three decades. Together we’ll get the maximum performance from your BCM 8000 Multimedia System for your venue. Add a new dimension to your venue! The visual spectacle enhances the customer experience. Music & video clips are perfectly tuned to each other so you can combine them in the same playlist. When you’re not playing a video clip the system automatically switches to your promotional videos and pictures. It has never been easier to communicate your message to your customers! Text and news scollers can always be running, even during video clip playback. - Statistics – most played songs, most played categories, number of songs per category etc. Please note that an Internet connection is required for all systems. Please fill out the contact form and we’ll refer you to your local dealer.